By now you know that there are a ton of bookish stores out on the interwebs, and Erin and I have been trying to think of a way to bring them to you your attention for quite some time… we know not all of you are on instagram and twitter… so we’re trying a new feature! This week we’re talking with Shannon from Canterbury Road Co Candles. 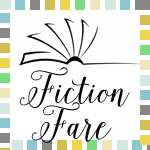 If you’re reading this blog, then you love books and if you love books, you’re also going to love her store. We love everything and well… I’ll let you check out some more details for yourself! Check out our interview with Shannon below! 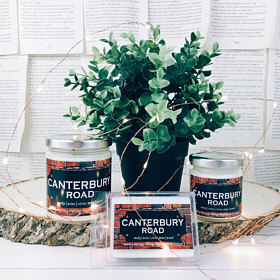 What is the story behind Canterbury Road Co? Where did the name come from? How did you get your start in candlemaking? Oh my goodness. Canterbury Road Co was such a long time in the making. I’ve always obsessively marked and noted smells listed in books and have always been scent-obsessed as well. My Bath & Body Works collection has been downright worrisome since I was old enough to shop. I’m also one of those people whose brain is extremely olfactory focused. Scent is my memory trigger and then when you add in my complete booknerd life, I’m honestly surprised it took me this long. 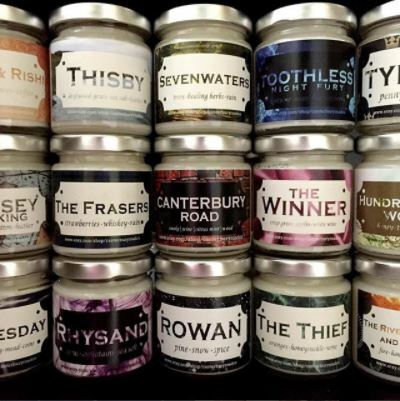 So much love appreciation to the very first bookish candle shops for their amazing work and genius and book love. 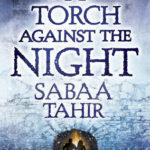 I remember seeing a bookish candle for the very first time; my jaw dropped I felt this….magic shimmer up my spine. I’m not writing a YA novel right now, I promise you this is REAL LIFE, hahaaha! (I wouldn’t be ME if I didn’t stop here and shout about those very first companies I saw—this is nowhere NEAR complete, it’s just the shops that opened my eyes to the bookish candle world! 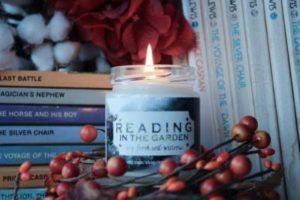 – From the Page: Callie’s scents are consistently amazing and her Reading Nook candle is one of my top five scents ever! – North Ave Candles: Amanda is seriously my burst of sunshine on hard days. Her Banned Books line is to die for and she works with The Ripped Bodice AND she’s super funny and OH YEAH HER CANDLES MAKE ME WANT TO CLIMB INSIDE AND LIVE THERE (I’m still burning the Great Pumpkin, I need 800 of these). –Frostbeard, of course, is another OG book candle shop. Have you seen their redesign?? It’s beautiful! It took me two whole years to get ready to do my own, and even longer than that to convince myself that I had anything to offer the bookish candle world. The passion for my shop was strong, though, and I’m so grateful. I love every square inch of this job to pieces. I lived and went to school in Oxford, England for a bit and about 97% of my heart and soul still reside there. The street I lived on was Canterbury Road and I thought maybe I could negotiate some of my soul back if I paid Canterbury its dues! Just kidding. I can’t ever get those back. And! The Canterbury Tales, obviously. How long has Canterbury Road Co. been open? I opened on July 17 of this year! I’m just extra enough to open a shop on my half birthday! Perfect gift to myself. I think I waxed poetic enough about this in the first question, so I’ll say the practical answer here: because they are functional comfort. And it’s REALLY fun to make a candle. I love cooking and baking and weirdly, making a candle is very similar. It takes a really good instinct to get JUST the right blend and I love doing that. And that’s just the candlemaker side. The book lover side? 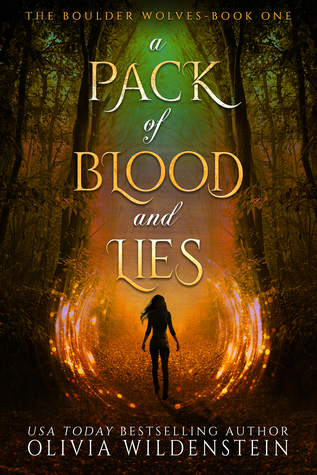 There is something really special about taking that MOMENT of a story—you know the one I mean, when your heart twists and your blood starts to sing and you can feel the fire of the Book Magic racing through your body?? That moment– and taking it from intangible to tangible, imaginary to palpable. I’ve read voraciously since I could hold books up with my own two hands and have years and years of that book magic fueling me. It is beyond a wonder to put it in a candle that someone else will love, too. So that meeting of tangible coziness and book magic?? 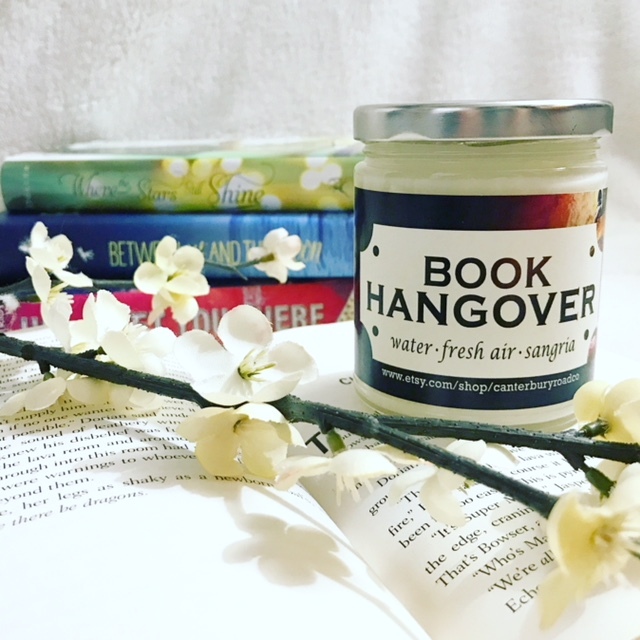 Bookish candles! 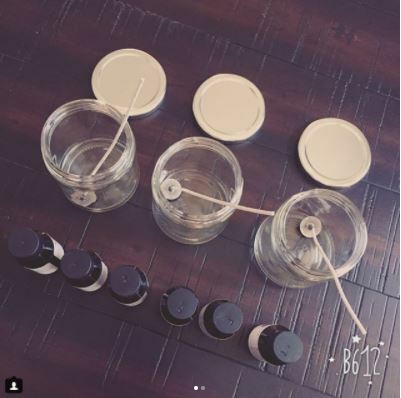 What does a typical day of candlemaking look like for you? Uhhhhhh. I’m the WORST person to answer this. My factory setting is “nocturnal” so it really varies. I try to do most of the Business part during business hours which means I actually Candlemake all night which means I do not get NEARLY enough sleep. I just made myself some coffee at 3PM if that says anything. There is so much to juggle when you run a creative business alone. How long does it take to create a new candle and scent? This varies, too. There are some that I create in 5 seconds and some ideas that I’m STILL figuring out from before I opened. Some blends are easy and some take ridiculous amounts of finesse. It’s the same with the labels. The Gomez and Morticia label of mine was a one and done draft, but I just redesigned my Blue Sargent label because I’ve never been happy with it. One of my reps was just amazing enough to lend me an ARC of THE CRUEL PRINCE and we’ve already created a candle for that, ALMOST by accident, because it was so easy. What is your favorite candle/book combination you’ve made so far? Oh, I cannot, C A N N O T pick. I love too many. I really really love my Thief candle (Megan Whalen Turner’s The Queen’s Thief series) and my Toothless candle (I am TOO obsessed with dragons and I am literally listening to the HTTYD soundtrack as I answer these.) I am very proud of my Reading in the Leaves candle, because it’s such wild scent. When it’s cold, it’s the sweet smells of fall, but when you burn it, you get the crisp air of a cold autumn morning! Also, I think my shop’s namesake candle is DREAMY. I spent….way too many nights in the pub across the street from my Oxford house doing homework and escaping roommates and reading and unwinding. My Canterbury Road Co candle smells just like the atmosphere of that old pub and it makes my memories sing. You must be a reader… can you tell us which book you’re dying to make a candle for next? Yes! I am starting THE NAME OF THE WIND today and I can’t wait to make candles for it—one of my reps and I designed a Wind custom for her just this weekend. Also, I seem to have a thing for thieving tricksters, so you can probably expect a Locke candle soon! Can you give us some spoilers on anything new we can expect in your store? 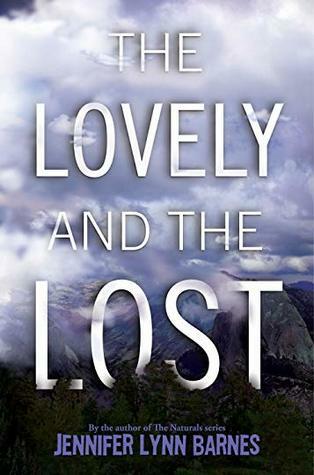 Hmmmm….I’ve told you about THE CRUEL PRINCE and THE NAME OF THE WIND….what else can I tell you?? Oh! Regency romance lovers should keep their eyes on my rep Alexa’s feed and writers should DEFINITELY check out my page for the November candles….I planned something really really special for the writing side of the Book Magic, not just the reading side.